Featured image: Villagers protest about the closing of floodgates. Photograph, courtesy of the NBA movement. 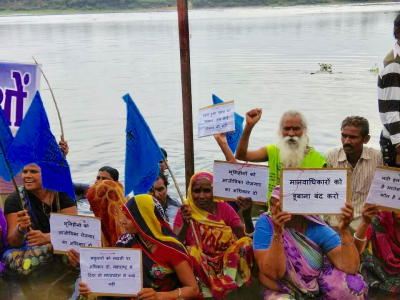 International support is today pouring in for the Narmada Bachao Andolan (NBA) movement defending the interests of the people affected by several big dams in India’s Narmada valley. A letter signed by civil society organisations from 29 countries has been sent to Narendra Modi, India’s Prime Minister, asking him to order the reopening of floodgates closed last month. If he doesn’t act, another 192 villages inhabited by some 40,000 families will be deluged between now and the end of this month. The NBA movement’s earlier actions resulted in the first ever withdrawal from a dam project by the World Bank – and a sense of some justice served for around 14,000 families. But things have taken a sour turn this summer. Local authorities not only decided to unlawfully close the dam’s floodgates in order to store more water, they also arrested hundreds of peacefully demonstrating people under what the protesters claim are false charges. The authorities issued a 31 July deadline for locals to move – thus adding around 200,000 to India’s long list of internally displaced people. In response, twelve people began an indefinite hunger strike on July 27. On Thursday last week they were joined by hundreds of others. The vast majority of the 40,000 families who are witnessing the drowning of their homes and communities simply have nowhere to go. The few rehabilitation projects that do exist consist of shoddy tin sheds with no drinking water. Medha Patkar (62), who spearheaded the NBA movement and has won several international awards for her efforts, is on hunger strike. Yesterday was her eleventh day without food and her health was clearly deteriorating. Patkar is just one of many hunger strikers. Yogendra Yadav, Sandeep Pandey, Dr. Sunilam and Alok Agarwal are other participants who have a high profile across India. The hope of the movement is that the Indian government doesn’t want to risk a national – and maybe even international – embarrassment. To understand the motivation and risk-taking of the Indian hunger strikers, it’s important to look beyond the hundreds of thousands who have been, or are about to be, displaced by force. It’s more about the lack of real rehabilitation, compensation and the massive corruption. The Supreme Court of India clearly stated that resettlement and rehabilitation of the affected families has to be complete before any forcible displacement is directed. Closing the floodgates is a de facto method of forcible eviction and therefore in contradiction with the court’s order. To make things worse, a report from the Justice Shravan Shankar Jha Commission concluded in 2016 that at least 130 to 200 million euro meant for rehabilitation ended up in the pockets of fraudulent middle-men. History has shown that this struggle is about a lot more than compensation. It was the NBA movement that eventually led to the formation of the World Commission on Dams. The NBA has raised the issues of the rights of indigenous people, advocated for environmental conservation and for the protection of centuries’ old archaeological monuments from submergence. The NBA has also significantly contributed to the debate around ‘development’: what kind of development do people in India want – and for whom? Forced evictions only add to the list of ‘unfreedoms’. Ashish Kothari, the chairman of Greenpeace India and a long-time NBA ally, explained that the movement is not just against dams. Ashish is also part of the European research project EnvJustice, which expressed its support to the hunger strikers and demands of the NBA movement. The NBA has led the immediate demand to re-open the floodgates. But it has also called for a comprehensive investigation so that villagers made homeless by the dam project are rehoused and compensated before the project begins. This merely implements the orders of the Supreme Court. The NBA also demands benefits be paid to farmers, in line with the Supreme Court orders. The movement has also called for the formation of a committee to assess the impact on the environment, rivers and forests by submergence, and also the impacts further downriver. Noam Chomsky, the philosopher and activist, has expressed support for the NBA petition to Modi, saying action was “essential to ensure the faith of people in non-violent, democratic and constitutional governance and struggle for their rights”. Will Modi respond? With hundreds of his citizens in a nationally – and now also globally – publicised hunger strike, we will probably soon find out. The Ecologist contacted the Indian High Commission in London yesterday but as yet there has been no response. Nick Meynen is the Project Officer for Global Policies and Sustainability at the European Environmental Bureau.